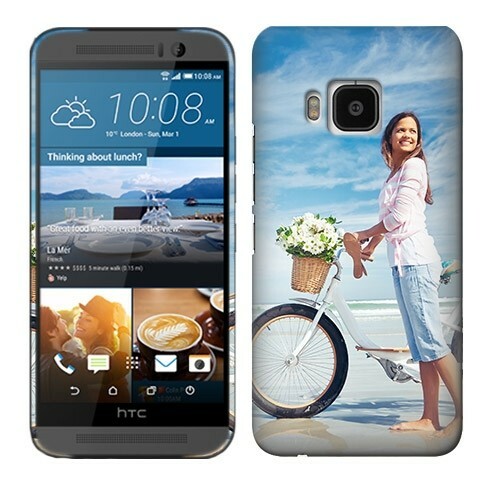 Design a customised full wrap HTC One M9 hard case. Upload your favourite memory, with a photo or design. Your own personalised phone case to protect your phone. Why should I choose for a full wrap case? To start off with one simple reason, its awesome! A full wrap case from GoCustomized gives your phone a one of a kind look. The design that you make will be printed on the entire case. That means not only will the back be printed, but also the sides will be completely covered with your custom design. This gives you the chance to make some really unique looking phone cases. We know that the M9 is a beautiful phone, but we also know that we want to keep it that way. Using your phone without a case is a guranteed way of getting it damaged. So start making your one of a kind case now! First dive deep into all your favourite photos. It doesn't even need to be an actual photo, it can also be a cool pattern or design that you really like. You are free to print pretty much anything on your phone case. As long as it falls within our rules and regulations (they are pretty easy going!). Once you have uploaded the picture you want to use, make sure it is of the right quality. Our design module can handle data files up to 6MB. That should be plenty to get a crisp, clean image. Reshape and resize the image until it fits just right and proceed by adding a little personal text. Done? Good! Order away so we can get cracking on your new phone case. When do I get my master piece?